A private U.S. rocket company, SpaceX, has earned a spot on MIT's Technology Review list of the 50 most innovative companies on Earth by pushing its commercial spaceflight dream of launching humans and cargo into orbit. 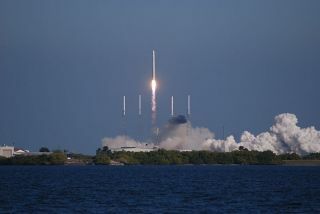 SpaceX orbited its Dragon space capsule twice, after launching it aboard a company-built Falcon 9 rocket on Dec. 8, 2010. The successful recovery of Dragon followed the capsule's reentry and splashdown in the Pacific, and made SpaceX the first commercial company to recover a spacecraft returning from orbit. Dragon's first flight marked the first demonstration flight under a NASA contract to provide commercial supply services to the International Space Station during at least 12 cargo missions. SpaceX also recently submitted a proposal to begin developing a version of the Dragon capsule to carry astronauts into orbit. "SpaceX was founded with the goal of revolutionizing rocket and space technology in order to take space exploration to the next level," said Elon Musk, SpaceX CEO and chief technical officer. "Making this list is one more sign that we are making that dream a reality." Musk previouslycofounded the online payment system Paypal. He went on to establish SpaceX, based in Hawthorne, Calif., along with electric carmaker Tesla Motors, headquartered in Palo Alto, Calif. His entrepreneurial vision and drive served as a real-life inspiration for the updated Marvel superhero "Iron Man." The editors of Technology Review chose SpaceX as one of the 50 most innovative companies in the world by using several criteria. They chose those companies which had proven superior at not only coming up with inventions, but also using such inventions to grow their businesses and revolutionize modern life. Similarly, Technology Review singled out companies that had promising technologies, strategies for deploying and scaling up their technologies, and a solid likelihood of success. "Private companies will dominate near-Earth space travel," said Jason Pontin, Technology Review editor in chief and publisher. "And SpaceX, with its manufacturing advances for making rocket engines and astronaut capsules, is leading the way." This story was provided by InnovationNewsDaily, a sister site to SPACE.com.